This new evolutionary model of the Universe that I propose attempts to explain most of the hitherto unexplained problems of astrophysics like the preponderance of matter over antimatter, the observed accelerated expansion, dark matter & dark energy through one elegant theory involving multiple dimensions. It is a significant revision of my last proposal and also provides substantial observational evidence that strongly supports my hypothesis. This is the 4th Part of my 'The Secret of Secrets' series of videos. A new integrated hypotheses on the universe and its evolution that explains its observed accelerated expansion, dark energy, dark matter, preponderance of matter over antimatter in our universe, the Pioneer anomaly, multiple universes and multiple dimensions. This also sheds more light on my two previous "The Secret of Secrets" series of videos. Hence this can be considered Part 3 of "The Secret of Secrets." A Dream or a Premonition? It is just about a dream I had and what happened after. You are free to draw your own conclusions. On the 2nd of December, early morning, I suddenly saw a dream which was very vivid. I am in a beach. It was a sunny and clear day. On one side of the beach there were vendors selling trinkets. There were people at the beach but it was not crowded. From the people and vendors, I feel it was somewhere in Latin America, but I am not sure. All of a sudden I see a huge mushroom cloud forming at a distance on land. People panic and start running thinking it was a nuclear explosion somewhere inland. The mushroom cloud grew to an enormous size and quickly approached us. And to everyone’s astonishment, giant alien space ships began emerging from the mushroom cloud. It was then that I distinctly heard the 5 words coming from the sky. The first 3 that were together were “March Alien Invasion”. The other two, which also came together, were ones that I did not understand. It said “Gloroh Bosoh”. And then I woke up and immediately asked my wife who was already awake, to write down the words, lest I forget. Later that evening, I casually Googled the words, “Gloroh Bosoh”. Google returned the results saying ‘Did you mean: glory bush’ in the first line and displayed a list of links containing the words, ‘Glory Bush’. I clicked on a Wikipedia link, which was one of the topmost. 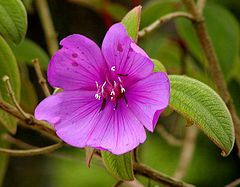 It led to the Wikipedia page titled Tibouchina (http://en.wikipedia.org/wiki/Tibouchina), which seemed to be a plant also known as ‘Glory Bush’. I clicked on the link that said “Invasive Species” (http://en.wikipedia.org/wiki/Invasive_species). The first thing that caught my eye in the page that followed were the words "Invasive Alien Species". Hmmm. This is getting more interesting. Of course, I know that here they are speaking in a biological sense and does not mean anything from outer space. Nevertheless, I found the words that appeared in my dream leading to “Invasive Alien Species”, which was perfectly relevant to the context of my dream, strangely synchronistic. It seemed as though some entity is trying to tell me something. Is it trying to warn me of an alien invasion in coming March? Something even more strange happened the next day. I googled the same words, “Gloroh Bosoh” once again. But to my surprise this time I got a completely different set of links leading to pornographic sites. As though someone controlling the internet, didn’t want me to follow the links to the Wikipedia page on Glory Bush and subsequently to alien invasion. The picture of the flower seemed familiar. 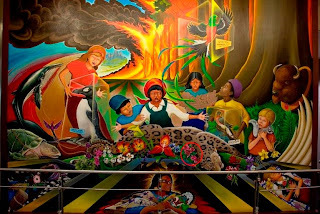 For some reason I was reminded of the strange murals at Denver airport. Particularly this one. I notice that a similar looking flower is also shown (circled in red above). Beneath the jaguar in the picture. In the background the girl in the blue dress seems to be holding a map of a country. The outline seems similar to that of Peru (if it is tilted backwards by 90degrees). 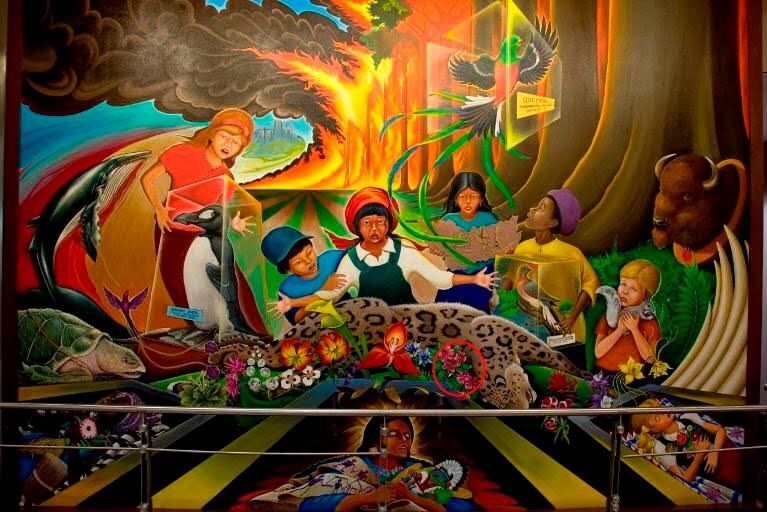 Peru, as you may know, is an extremely important place as far as the UFO phenomenon is concerned. I may be making big leaps here, but somehow I feel it is like a jig saw puzzle falling into place. Again I am not saying that an Alien invasion is going to happen in March, possibly first somewhere in Latin America. But if something similar does happen, I have this distinctive feeling that even if it is first portrayed as an “invasion”, it will finally be for the benefit of all humanity. The mushroom cloud could be symbolic to the initial feeling of fear that is bound to arise immediately following the event. I see an open and large scale contact with a peaceful higher intelligence inevitable prior to the Dimensional Shift. I was reluctant to disclose this to anyone initially. After all it could be just a dream and nothing more. But the intensity of this feeling that something big is impending has been growing day by day. Moreover, the related synchronicities seem to suggest that it is more than "just a dream". I leave the reader to make a conclusion.